At this stage in my running story the half marathon is my favourite distance. However, it always seems to be half marathons that cause me the most grief. My first half marathon in Newport was deemed short. Whilst that was a shame, it can be dealt with, and was, by running an impromptu second half marathon in Llanelli the following week faster than my ‘nearly half marathon’ attempt the previous week. 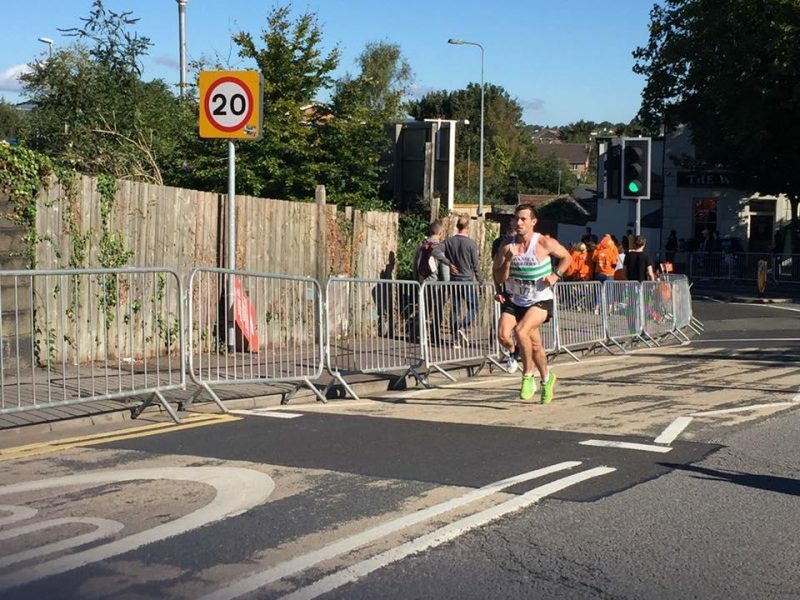 Next up was Swansea Half Marathon 2015 and despite starting the race well my stomach started to cramp severely, and I staggered to the finishing straight bent over in pain (somehow I mustered a sprint). I took refuge in the fact that it was another PB but it was another opportunity wasted. Things started to pick up when I qualified for a Championship place at the London Marathon with a 74 minute half at the Great North Run. Consequently, in the lead up to my debut marathon in London I ran faster than I could have imagined when I clocked 71:56 at the World Half Marathon Champs. However, this race wasn’t without its drama, as a ridiculous storm came and stopped me in my tracks at 10 miles. The gale force wind and hammering rain made it almost impossible to run, then again run fast. So I had to settle for a big PB but it should have been an even faster time. Oh, and I hurt my shoulder trying to fight the wind. Pathetic right? “No more excuses Matt”, I told myself. Well, next up was Cork Half marathon. 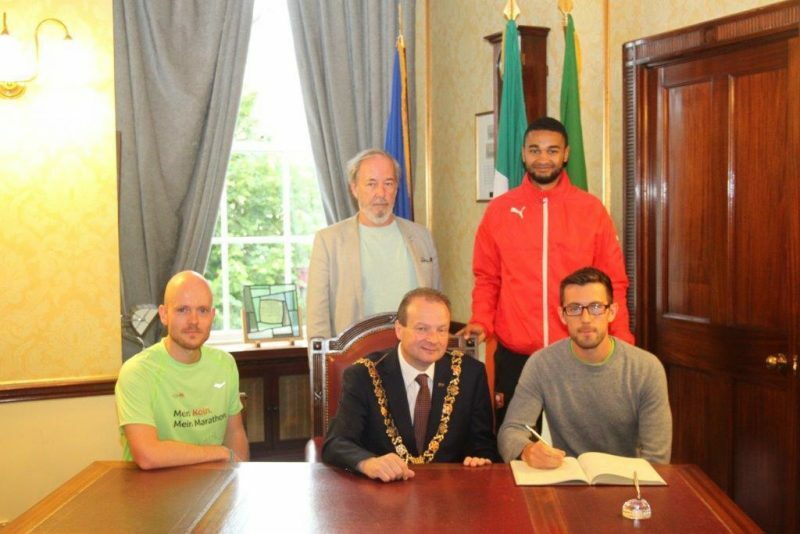 I had been very fortunate to get invited to run the race by the Mayor of Cork City. I say invited. What I mean is that Cork were looking for a Swansea based runner of any standard, due to the fact we are one of their twinned cities. I am nothing special, they didn’t specifically ask for me, but I jumped at the opportunity. This was a great weekend spent exploring Cork with my dad. I paid for his flights and an extra night’s accommodation. It was his birthday surprise, and we got to experience the Redbull Soap Box Races whilst we were there too. My dad is the older guy in the picture below, the one wearing less bling. I’m not sure he was dealing with his post-race party hangover as well I was. Despite walking my dad’s feet off and exploring all the main sights of Cork perhaps a little too much time was spent in the heart of Cork, its pubs. A ready-made excuse. I eased off the Guinness the night before the race, and decided to try and stick with the leaders the next day. Well I stayed with the leaders for a few miles until we were sent the wrong direction a few times. When we finally made it on to the right course; amidst the chaos of running head on in to the marathon race that was taking place at the same time; my head was gone. I realised any PB chance had just gone so I saved my legs and tried to enjoy the race. I jogged around to finish 7th in a time 8 minutes slower than my PB. I did enjoy it, but I felt a pang of guilt for not pushing myself during the race. There was no sense of satisfaction. I had taken the easy way out. 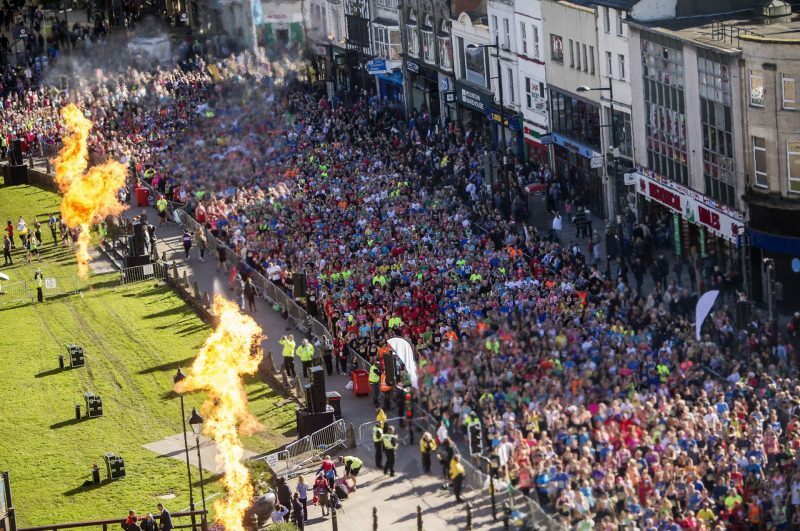 I was going to be mentally stronger for my second Swansea Half marathon. 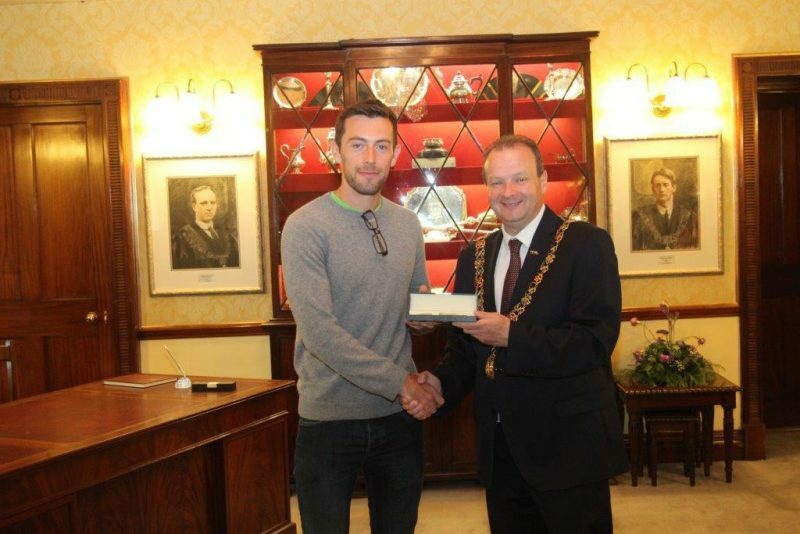 I had trained well and was delighted to be receiving my first elite bib, and in my home city. My surname in capitals, an elite tent parallel with the start line, and mixing with the fast boys I wish to emulate. Perfect. Until 6 miles in and I again started to suffer severe stomach cramps, and other unpleasant issues. You get the picture. Well embarrassingly this was my first DNF. My home race. My first elite bib. I was devastated. I felt truly let down by my body. I beat myself up about it. Had I been a wimp by pulling out? Why was I getting these problems in Swansea? I moved on, as you have to. 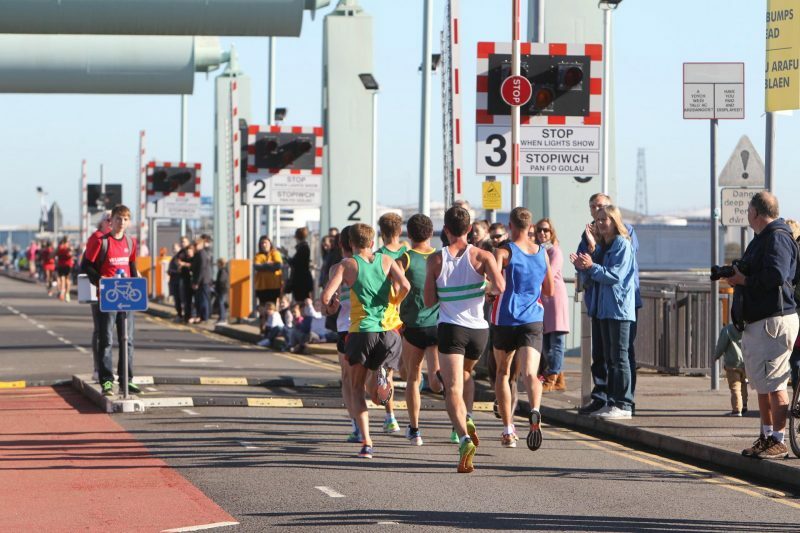 Port Talbot half was a chance to race my team mate Ian. He smashed me by nearly 5 minutes. It was never going to be a fast course, especially after racing the evening before, but I didn’t expect to get a flat tyre on the way to the race, fall in the first mile, and then for my laces to come undone shortly after. But the real issue was I wasn’t fit or strong enough. I had been found out by under-preparing. 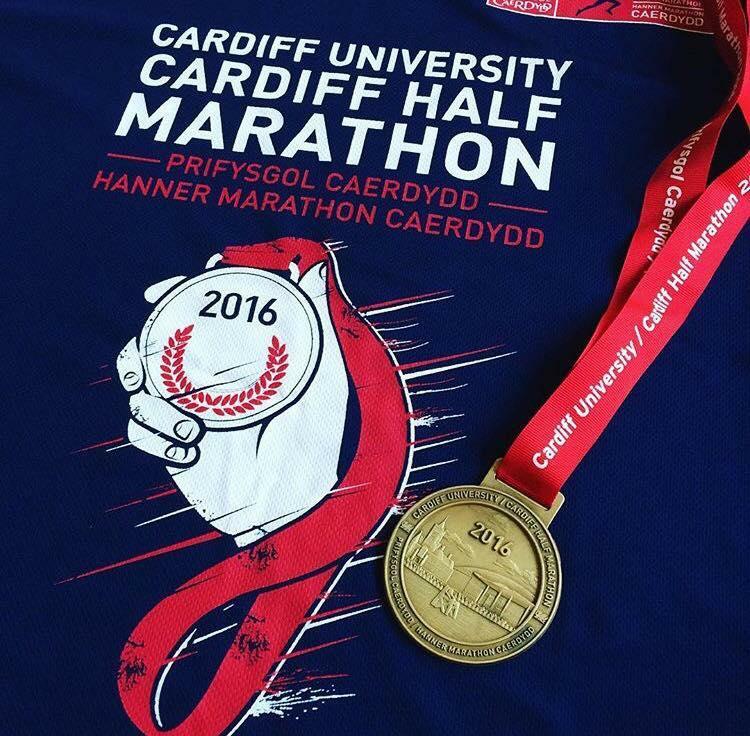 After going ‘back to basics’, I felt great going into my final week’s training before Cardiff Half Marathon. The plan for the week followed my usual structure; interval training on the Tuesday; a tempo session on the Thursday; and a long run on the weekend. The week gave me loads of confidence. 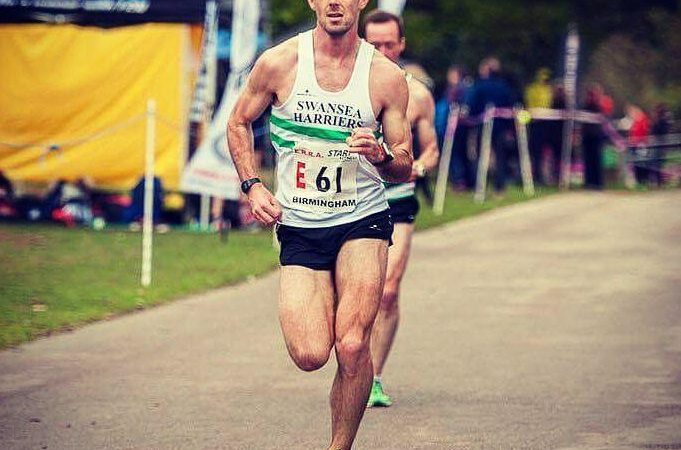 The Tuesday session saw me run intervals on the grass with the Swansea Harriers team. The session consisted of a 4-minute tempo at 5:10 min/mile pace; 10 x 90 seconds at sub 5 min/mile pace off 75 seconds recovery; and a 5 minute tempo to finish. I ran well and felt good, even pushing the group pace on for some repetitions. On the Thursday I met up with Ian to run a 10 mile tempo run. Ian has used this session before his best half marathon performances, and I was happy to join him. We decided that we should try and run the out and back course in approximately 5:45 min/mile pace. We wanted to get in a good session without pushing ourselves too hard and causing additional fatigue and damage to the legs that would hinder our preparations. We nailed the session. The average pace was 5:42. A tad faster than planned but it felt so comfortable. Imagine how good it will feel on fresh legs in race conditions I thought to myself. In order to race a local cross country race on the Sunday, I ran my long run on the Saturday. 16 miles at 6:45 pace felt very easy. Again I ran with Ian. We chatted the whole way mainly about running, as runners do. It’s amazing how some conversation makes a run pass by so quickly. 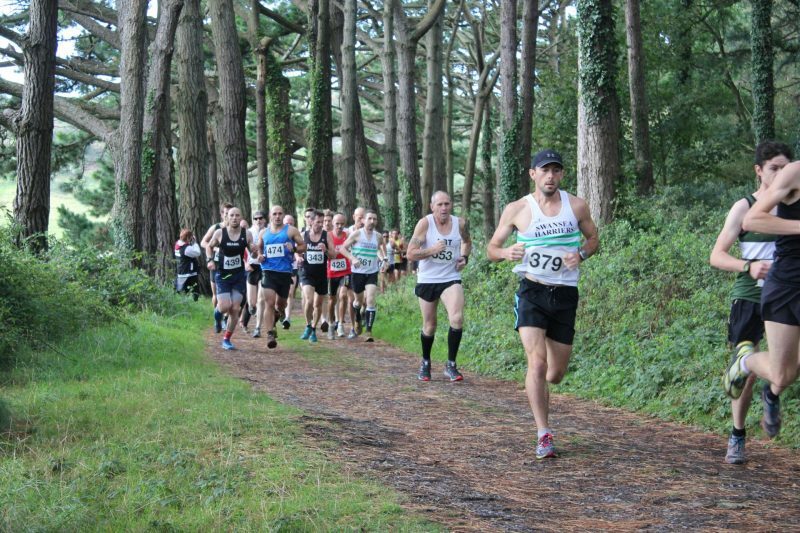 On the Sunday the first West Glamorgan Cross Country League fixture took place in the beautiful village of Llanmadoc in the heart of Gower. The race isn’t your typical cross country, as it takes place along forest tracks, out on to the beach, and finishes over a stony trail. No spikes required here. The race is a great event, and the turnout was incredible. I was a bit concerned on the morning of the race because my throat felt sore and I could feel the beginnings of a cold. I decided to not let it bother me and just run anyway. The race was extremely windy along the beach, which made it a tough slog, but I was determined to run in a relaxed manner. I managed to win the race fairly comfortably, which was a great feeling and continued to evoke confidence. I have never won a cross country race, so this was a great way to start the season, despite some big names missing from the line-up. Things started to go wrong in the taper. Don’t they always? On the Monday my throat was feeling worse, and my cold was starting to develop. I jogged 4 miles, but felt pretty awful, so decided that was enough. I didn’t run Tuesday or Wednesday. This is very unlike me. I just didn’t feel great and wanted to give my body the best chance possible of recovering. As usual when I don’t run I eat less healthy, and greater quantities. So by Thursday morning I had put a few pounds on and was feeling crap. I had to run. I felt so rusty doing 5 miles. It’s discouraging how a few days from running makes me feel like I’m a complete beginner all over again. My legs must have been quite fresh, but I still felt sluggish. There was no bounce in my stride and I had to work hard to run the steady pace I had planned. 5 more miles on the Friday. Slightly better but still some room for concern. On the Saturday I decided I had nothing to gain from trying to force anything and just ran an easy 2 miles to keep loose. I also wanted to make sure I ran as part of a Ronhill October #RunEveryDay challenge I have signed up to. I couldn’t falter on October 1st. I was gutted. I kept moaning to Vicki. Why did I have this cold? My chest was full of phlegm. I was coughing and running felt harder than it should. I was heavier than the week before and all of my confidence had been ripped away. I slept really badly on Saturday night. My mind was running over potential race splits. Working out different pacing strategies. I was nervous. I didn’t know what shape I was in anymore. Was I stupid to try and run sub 70 minutes for a half marathon with the remnants of a cold? I got up at 5:30am. I don’t think I had more than 3-4 hours sleep. Breakfast was my now standard race menu of 3 slices of brown toast topped with banana and honey. I then rushed around the house packing my kit. As usual I left this to the last minute. I like to have something to do on the morning of a race to distract me for a bit. After a frantic search for my kit bag, I was dropped in Neath to travel on the Run4All team bus. 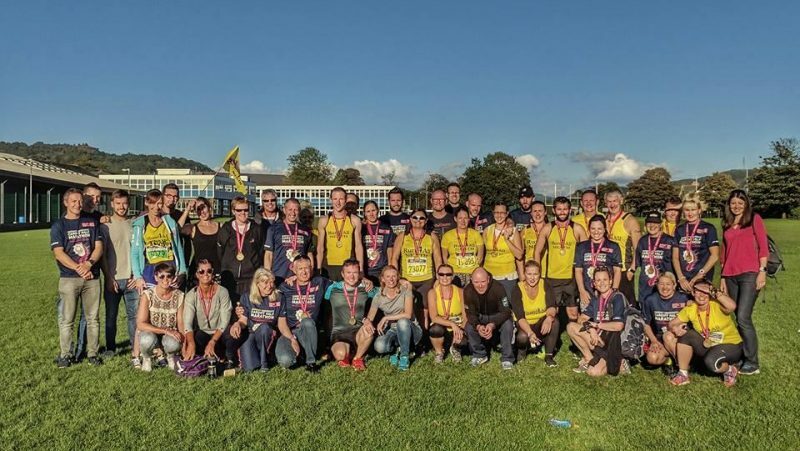 Run4All is a great local running club located in Neath. They were kind enough to let Ian and I, two Swansea Harriers, travel up to the race with them. I have never travelled on a team bus to a race before, but it would allow for some post-race refreshments without the issue of driving. The mood on the bus was one of excitement mixed with nerves. An hour and 1 beetroot shot later and we were arriving in Cardiff. The bus dropped us off and we walked over to the race village. We decided to leave our bags on Ian’s former running club Gorseinon 3M’s bus. This was very generous of them, as we hadn’t travelled with them. It sums up the running community in the area. All the different clubs are willing to help each other out. We are all runners. After a short warm up we realised the bus was now locked. Well the tracksuits will have to be hidden under the bus we decided. We hurriedly made our way to the starting pens, jumped over a barrier and lined up behind the elite runners. The gun eventually fired after a slight malfunction and we were away. The target was sub 70 minutes. That’s nearly 2 minutes off my PB. A huge ask, but I was bold in London, and it paid off. The start of the race couldn’t have gone better. I found myself at the back of a group, sheltering from the very little wind out on the course. The first mile was 5:12, which is fast but not a disaster for an excitable fast downhill first mile. The pack consisted of some quality local runners that I knew were also trying to break 70 minutes, and one of the fastest Kenyan women in the race. Statistically pack running is faster for a number of reasons, so the longer I could stay in this pack the better. 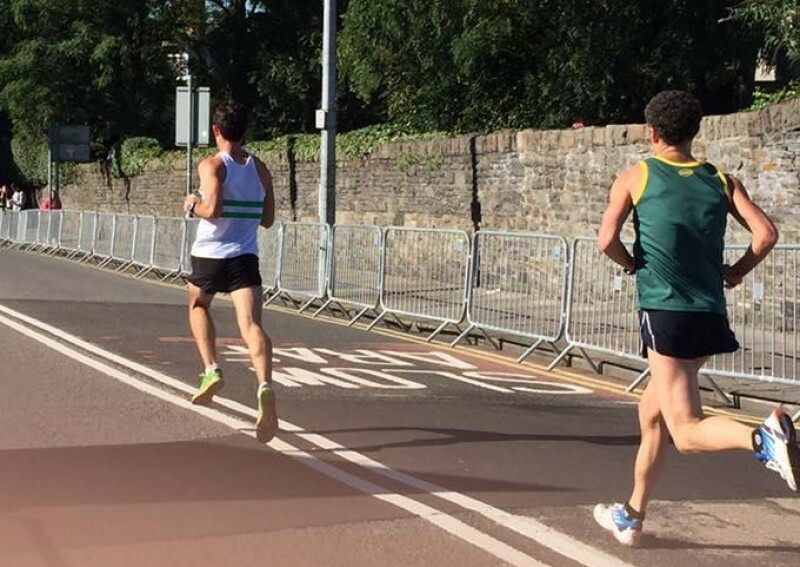 I felt relaxed and even congratulated Pontypridd Roadent Paul Graham on a big half marathon PB the previous week. They all require me to be mentally tough and suffer to get the best outcome. Well seeing as I didn’t have any new mantras lined up, I decided to use a different technique. I bigged myself up. I was running at the back of the pack at about mile 5, and it was starting to feel fast. I used these positive statements and everything felt easier. It was great. I kept telling myself that the end of the race would be fun because that’s when you actually race. I knew Batman and Robin were coming. I could hear children and adults alike cheering them on as they reeled our group in. The two fancy dress charity runners moved to the front of our group. 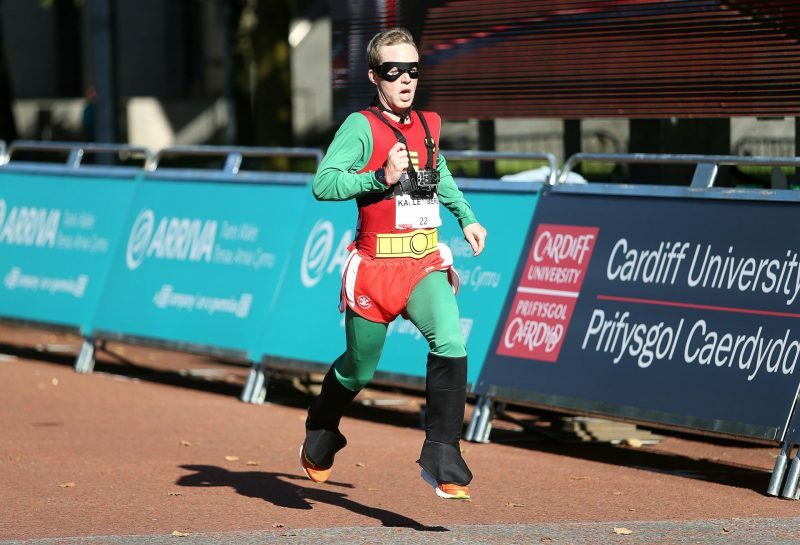 I say charity runners but they are actually quality international athletes, generously raising money for a friend of theirs who was recently in a parachuting accident (https://www.justgiving.com/crowdfunding/batmanandrobin). I was aware the two runners were trying to set a new superhero half marathon world record, and were aiming to run just inside 70 minutes. Brilliant I thought. They can pace the group, and we might even get some airtime on the BBC coverage of the race. However the pace was starting to feel uncomfortable. The third placed female Kenyan dropped off. 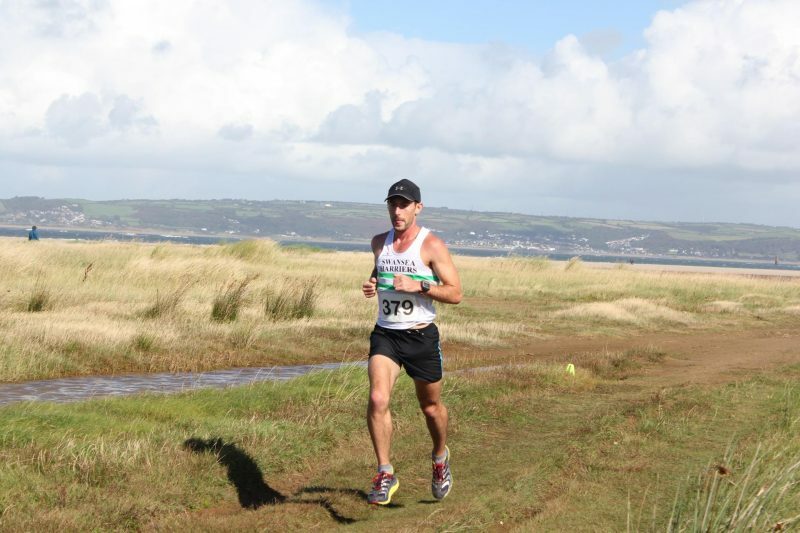 Next was Mark Jennings, a local runner who has gone sub 70 before. Shaun Dixon, a Welsh international, was gone. Before I even knew it I was off the back too. The group was no more. The superheros had made sure of that; cleaning up the streets; no unruly groups of skinny runners allowed in this city. 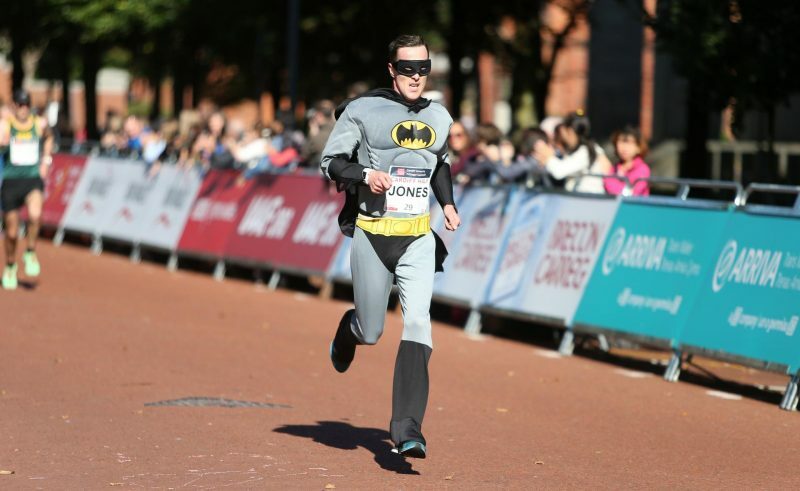 Had the superheroes injected some pace or had we been going too slowly to achieve our target? I didn’t know, and I was starting to suffer as I went through 8 miles. The course gradients were starting to hurt my legs. I attempted to stay positive. I was running with a fellow Swansea Harrier Phil Matthews for a bit. I could see a runner not far ahead, so I surged and was just about able to catch him and latch on to the pace, settling in behind him. 10 miles in and my average pace was approximately 5:22 per mile. I was slowing. Sub 70 was slipping away. How could I kick on and increase the pace now. I battled back and fore with the runner I had caught, he won and pulled away. I was losing the mental fight as it became physically more difficult. The next mile does have some incline gradients but that is no excuse for running a 5:45 mile. I was falling apart. I picked it up to 5:30 for the final 2 miles but this is when everyone else is pushing for a fast finish. I was losing focus and struggling. Mark Jennings came up behind me. I’m going backwards, I thought. For a second or two I was defeated, and then in a snap decision I thought why am I going to let another runner past this late on without a fight. It is these moments where you need to be mentally strong. In a brief moment I could have given in to the pain but I decided to resist. In difficult parts of a race your mind is deciding whether the pain of sustaining the pace is worth the reward. That is why I struggle when I let a goal slip away, the reward diminishes. A PB was on the cards whether I let Mark by or not. It is one area I need to work on. I want to push my body to the limit and this is only possible if I can be mentally tough. This time I won the mental war. I surged, and before I knew it I was on the home straight. A quick glance over my shoulder and I had dropped Mark. I was sprinting but I didn’t seem to be moving very fast, and then before the suffering of sprinting had really kicked in it was over. I looked at my watch and it told me that I had run 71:04. Nearly a minute PB. I was delighted. It was way off my target but I gave what I had on the day. You can never be disappointed with a PB. After the race I was able to relax. I went for a light massage which was the perfect start to my recovery, and something I should definitely do more often. Then it was to the pub to drink a few craft beers; meet new people; and chat running. One of the more thought-provoking conversations was with Chris Lloyd, a young runner who had just run a 1 hour 28 minutes half and a brilliant PB. I was really pleased for him and congratulated him on running a great time. I then went on to learn that he runs between 3-5 miles a week. I was shocked. He does one session with Run4All every week and nothing else. This was kind of impressive but also so disappointing. He seemed proud that he was able to run such a competitive time off such little effort. I didn’t see it this way. Any runner who can run a time like that without training has clearly got talent. I am of a totally different mind-set to him. I revel in the miles. I want to work hard. I don’t run a race to run a fast time or beat other people. I run a race to test myself. I am racing against myself. My training prepares me for a race. It is one of those awful clichés but my training is the journey. The races are a side note really. They serve as a goal to train towards, and they assess how well my training has gone. I never run a good race, achieve a target and think well that’s it, I did it. I always want more. I almost immediately start thinking how I will train to get better, to run faster, to improve. There is no end, just a passion for self-improvement. I clearly have some talent as a runner. I would be naive to think otherwise. However any talent I possess doesn’t define me. I work hard so that I can beat more naturally talented runners, but also so I get that sense of achievement. I would be almost embarrassed to turn up to a race and do well without working hard for it. What would be the point? I feel a sense of satisfaction when I run well because I know how much I sacrificed to run that race. I am not saying I sacrifice more than other runners. Running and training is all relative. What I do know is that I often go for a run when I really don’t feel like it. I’m tired, it’s raining, it’s early, it’s late, I’m busy, I’m hungry, I’m full, I’m sore. We have all been there. I love beer, and I hate that I regularly have to tell my friends that I can’t drink because I am racing the next day, or even the next week. I need to earn that performance, and I do that by preparing myself the best I can both physically and mentally. Chris Lloyd is happy with his performance, and really that is what is important. In the end enjoyment is the real goal in any venture. I get my enjoyment from working hard and seeing myself improve. Chris may not need the same things to enjoy his running. He is part of a great team and enjoys training with them once a week. If he doesn’t want to do easy runs, or more sessions, or long runs then that is his prerogative. It just made me realise some things about how I approach running in my life, and what it means to me. Ian and I got back to the bus late after being a bit too relaxed with our post-race, post-pints amble across Cardiff. The Run4All team all sarcastically cheered as we arrived. “Not so fast getting back to the bus” one heckled. It was all in good spirit, and I thought they were very patient to wait. The journey back was great hearing about different runners’ experiences racing and such enthusiasm to sign up to future races. When I returned home, I was properly able to reflect on my performance. I think the time fairly reflects the standard of runner I am at the moment, and 24th place out of 17,000 runners is remarkable. However, I can see so many areas to improve, so that’s what I will do. Keep learning and keep striving for more, but most of all keep enjoying. 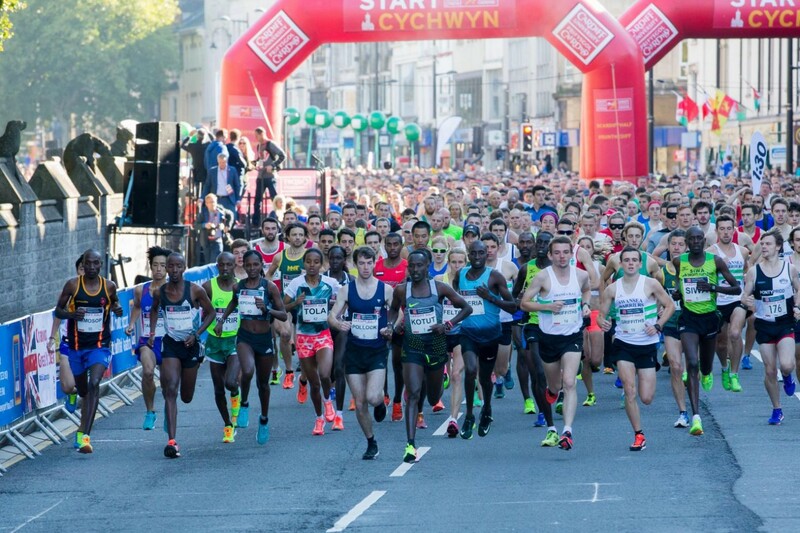 Photo credits: Marion Fanning, Mark Evans, Run4Wales, Paul Stillman, Nick Francis and Run4All. 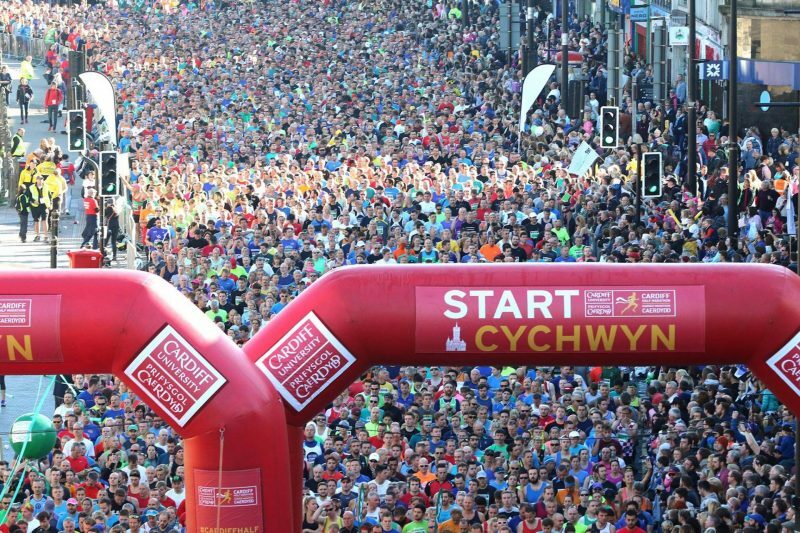 Great account of your Cardiff half experience, really enjoyed reading about your thoughts, mental strategies and training. To come so far in just a few years is awesome. Keep it going. As a member of run4all and training with Chris most Monday’s. I was telling him just the same thing following the Cardiff half performance. Also reassuring to hear that I’m not the only one to suffer from stomach cramps during races! Best of luck in future races. Thanks. Thanks Andrew. I really appreciate your feedback and glad you enjoyed the post. Chris can get better if he wishes, it’s up to him and what he wants/enjoys. Stomach cramps are the worst. I still don’t know how to avoid them but they can completely ruin a race. If you are interested in future posts subscribe by email on the right hand side of the homepage. Brilliant. I enjoyed reading that Matt. A fascinating insight into your running world which is remarkable to me. Love looking on at your progress and so glad you have started blogging. For us mere mortals, reading about how you prepare and the importance of mental strength is really interesting indeed! Sub 70 is only a matter of time! Thanks Jon. Some really kind feedback. Haha we are both mere mortals mate. Yeah I’ll keep plugging away. Thanks for reading. I aim to keep uploading more posts regularly so keep checking back.